"I have instructed Solar and Wind Applications to handle 2 of my larger renewable technology investment projects in 2010 and 2012 and have great confidence in the integrity, conscientious and thoughtful approach and balanced judgment applied to these innovative designs. Having recommended their work to others, I was pleased to hear in return the same comments on their attention to detail, quality of work and diligence that makes using Solar and Wind Applications a pleasure as well as an excellent business contract partner. I would be happy to recommend them for renewable energy projects and designs." Following rebuilding, from a derelict shell – improving the ecological energy efficiency of the proposed eco site was a cherished aim. This received a welcome boost in 2010 with the arrival of Feed in Tariffs – making a retrofit financially sound. 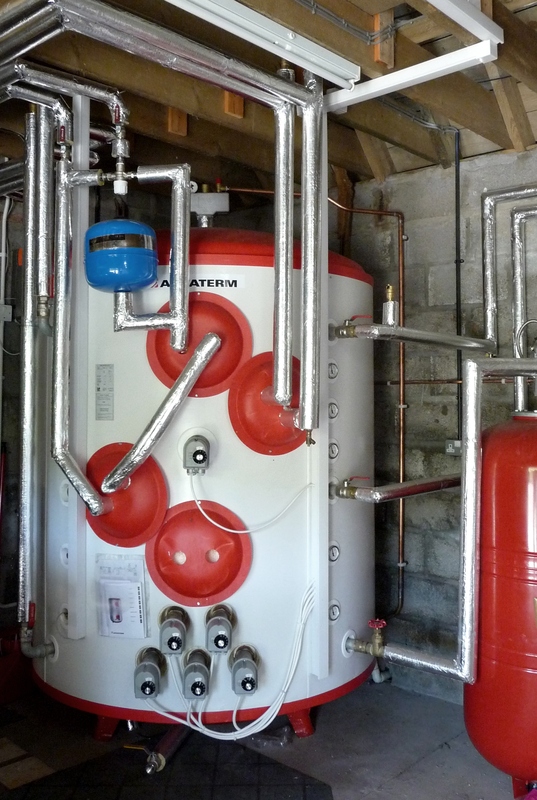 An integrated solution was sought, using Wind power and Wood Eco Boiler. Solar and Wind Applications Ltd were chosen as a best supplier from a panel of 3 firms based on the strong relationship management – down to earth approach and good technical skills. The company supplied and installed the Proven 11 machine after the owners constructed the groundworks, and it is delivering around 14000 kWh on a site with open vistas to the South West from where the majority of the winds arrive. The wind speed average is 6.3ms according to the National Wind Database. A joint project was formed with neighbours who invested in a second 6 kw turbine at their property. The installation was trouble free and the turbine has worked reliably ever since. In 2011 the owners increased their investment with a 10 kw Evoco Turbine. This is intended to supply power to the domestic property and the Proven supplies power to the smallholding. Once bedded in this more powerful machine is capable of double the Proven production, which was key to the Renewable Heat solution planned. The power supplied by the turbines is expected to reach a total yearly output of around 40000 kwh in total. Following closely the developments in Ecologically sound energy and Renewable Heat the owners wanted to remove as much dependence on heating oil as possible. The core of the design is a heat store for surplus domestic power generation, by way of an Accumulation Tank. 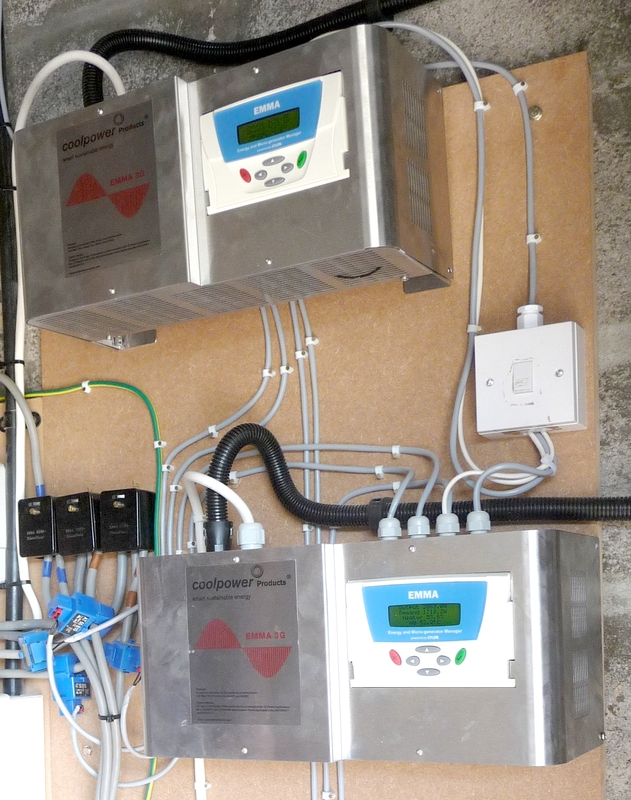 To enable this Solar and Wind Applications provided EMMA monitoring and control switchgear and cascade technology to allow surplus wind power at the property to be driven through a bank of immersion elements converting unused wind power to heat several thousand litres of water in the Accumulation tank. The heating solution was supplied by Border Eco Systems of Jedburgh, who advised on the overall heating design for the house, replacing conventional hot water plumbing and oil fired central heating. The system also required a backup source for calm days so a 40kW log burning boiler was added to the specification – centralising all heat generation and usage into a single solution. This was completed in July 2012, and should qualify for Renewable Heat Incentives once finalised in mid-2013. The system is very capable and has sophisticated computerised controls allowing optimum burning of logs with little ash, but is still very robust and intended to last 20 years. The whole renewable solution has been easily accommodated within the garage at the house, requiring minimal building alterations. This innovative system solution has paid dividends in reducing oil consumption by thousands of litres a year. The owners are delighted with the success of these projects and the improvements it brings in energy efficiency, return on investment, cost reduction and ecological practice. The system is robust enough to allow cheap energy heating in the coldest of winter spells. The cost/payback is expected to be very quick by conventional investment standards. The collection of the Feed in Tariff for the Wind Turbines also achieves some revenue to further reduce payback time. The log burner will also qualify for Renewable Heat Incentive once it is finalised.